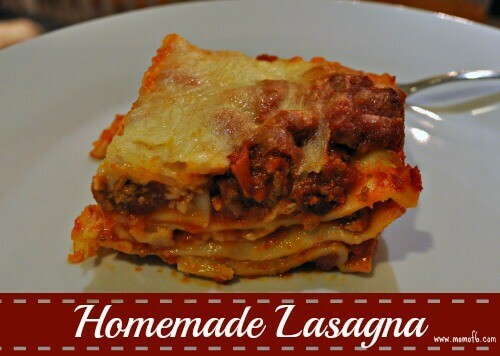 Homemade Lasagna: It All Starts with the Meat Sauce! 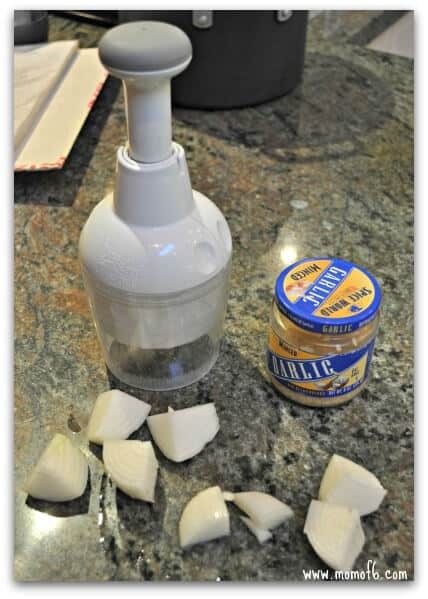 Like all great sauces, it starts with some chopped onion and minced garlic. Saute the onion and garlic in some olive oil until the onion caramelizes, then add in the beef and pork, cooking until it is well browned before draining off any excess grease. Add all of the remaining ingredients and stir. Bring the sauce to a boil and reduce heat to a very low simmer. Cover and cook for 3 -4 hours. After preparing your lasagna noodles according to the package directions, be sure to drain them under cool water so that they are easy to handle. Add a little bit of the meat sauce to the bottom of the pan so that the noodles won't stick. Then just start layering- noodles, sauce, cheese, noodles, sauce, cheese…. until you get 4 layers of goodness! 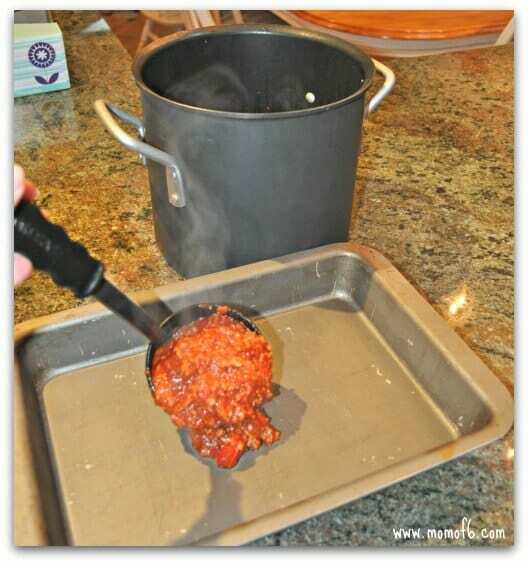 Cover the pan with non-stick aluminum foil and bake. I like to remove the foil during the last 10 minutes of cooking to brown the cheese on the top layer nicely. 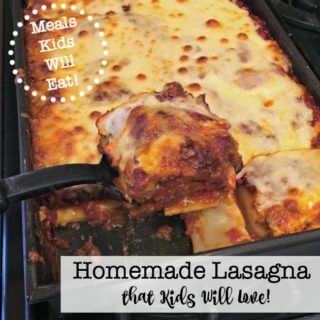 Allow the homemade lasagna to stand for 10 -15 minutes before serving, and even once you have cut into it and placed it on the kids' plates, be sure that it is not too hot for them to eat! This homemade lasagna recipe includes an amazing homemade meat sauce that slow cooks for hours before you bake it in the lasagna. It alone is worth making this recipe! Heat 2 tablespoons of olive oil in a large deep pot. Sauté the chopped onion, garlic, and dried parsley until the onion is tender and starting to caramelize about 7-8 minutes. After the onion has been caramelized, add in the beef and pork, cooking until it is well browned and then drain off any excess grease. Preheat your oven to 350°. Prepare your lasagna noodles according to the package directions. Drain them under cool water so that they are easy to handle. 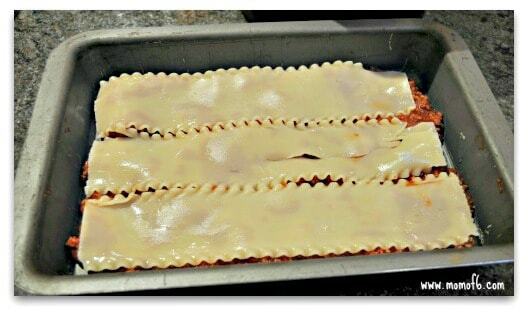 Prepare your lasagna pan (I prefer to use a 13 x 9″ baking pan) by adding a little bit of the meat sauce to the bottom of the pan so that the noodles will not stick. Layer 3 noodles side-by-side in the 13 x 9″ pan, add spread a generous amount of ricotta cheese over the noodles. 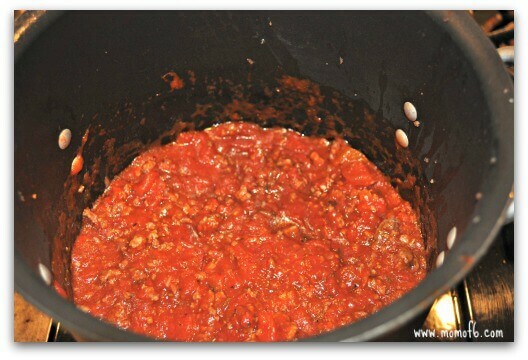 Next, add a nice layer of the meat sauce on top, and then add a layer of sliced or shredded mozzarella cheese. Repeat the steps- adding layers of noodles, meat sauce, and cheese until your lasagna reaches the top of the pan. As you get to the final layers it will likely be necessary to add four noodles side-by-side across the top, overlapping slightly in order to span the width of the pan. Cover the pan with aluminum foil and bake at 350° for 45 to 50 minutes. I like to remove the foil during the last 10 minutes of cooking to brown the cheese on the top layer nicely. 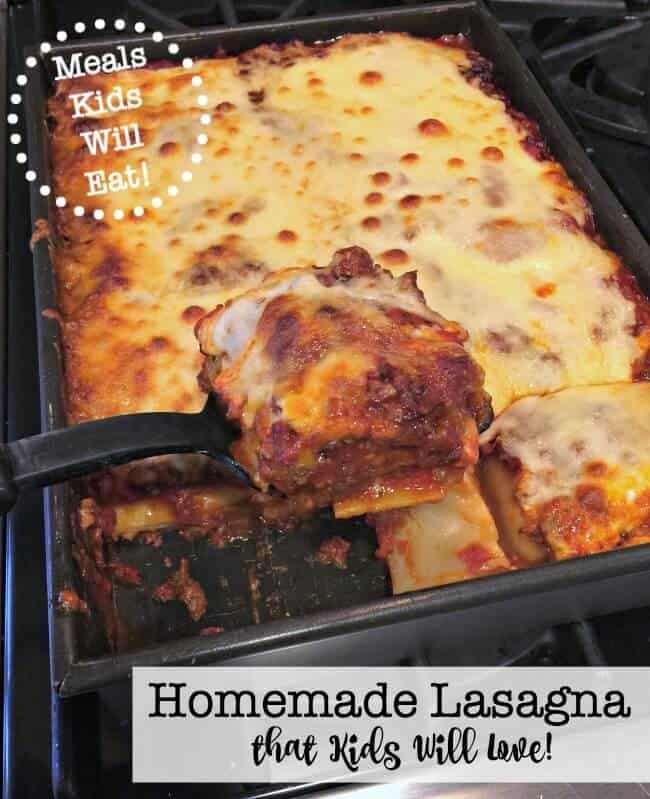 Allow the lasagna to stand for 10 -15 minutes before serving, and even once you have cut into it and placed it on the kids’ plates, be sure that it is not too hot for them to eat. « 10 Awesome Birthday Party Crafts for Tweens! My daughter might be the pickiest eater out there…but she absolutely loves this recipe and brags about it to others…not like her (she’s 13). Making it again right now 🙂 Thanks so much! You are so welcome! I have my own fair share of picky eaters too! I will be making some of your other recipes too! How do you find the time? I’m a single mom of 1 and I barely do! Shout out to you Sharon!! I love, love, love your meal plan section, especially since I use so many of your recipes. Thanks!!! I will make your lasagna soon.